I found the audio book edition at the public library when one of the books I had reserved for a car trip did not come in time. 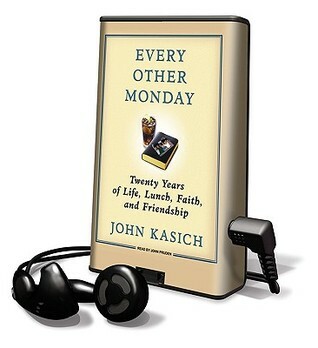 I had never heard of this book but decided to give it a listen since Kasich is now governor of Ohio, where I've lived most of my life, and since I have also been part of a men's Bible study group of the same size (call ours, "Almost Every Friday"). I was interested in how Kasich's experience compared with mine. I'm a little leery of politicians. I didn't want to read a self promoting propaganda piece. I was pleasantly surprised by this book. This is not a showcase for John Kasich's political views. It's a story of what it's like to have real group of honest friends centered around the study of Scripture. Kasich's group has lasted over twenty years. The book helped me to reflect on, and appreciate much more, my own experience with the seven guys that I've met with over the last nine years. It also gave me a better understanding and appreciation for the man, John Kasich, and his friends. I was very impressed with the depth and substance of the personal issues explored in this book in the context of the group. These men are not shallow thinkers, nor are they a group of mutually affirming sycophants. With all their differences, they genuinely care for one another. You have to get past the first chapter, which is no gripper, to really appreciate the book. Then it gets better as it goes. Kasich talks about the influence that religion had on him in his growing up years, how he departed from his spiritual roots as a young man, and the effect that his parents' untimely death had on his return to "basics", a struggle with the "big questions" of life and how this finally led him to gather together a group of men of different backgrounds and points of view for serious and candid discussions about how the teachings of the Bible apply to life. Over the twenty years, different men joined, and left, for various reasons but their lunch time meetings became a very important part of all their lives and these very different men became very close friends. This group meeting offered them things that the typical church Sunday school meeting does not: A chance to ask challenging questions, express serious doubts and to call one another to account for the way they've been living; all within the bonds of strong friendship. The stories about how these guys supported one another through some very difficult times, including the tragic death of one or their members, are well worth the time spent with the book. I recommend the audio edition. It's unabridged and well read by John Pruden in the conversational style in which it is written. Sign into Goodreads to see if any of your friends have read Every Other Monday.